Dog toys and cool gadgets. Pond Pumps, Air Pumps and Heat. AI Hydra 26 LED Light Units App-Controlled Full Spectrum & Aquarium Mounting. AquaIllumination Hydra 26 LED Units. Please use the drop-down menu to select your preferred model. The following options are available from Aquacadabra. AI Hydra 26 HD LED Unit &###x2013; White/Silver. AI Hydra 26 HD LED Unit &###x2013; Black. Slimline Designer Bracket &###x2013; Silver (for Aquariums 50cm wide). Slimline Designer Bracket &###x2013; Black. &###xA0;(for Aquariums 50cm wide). D-D Hanging Wire for single Hydra. The latest leap forward in LED lighting from AquaIllumination&###xAE; is Hyperdrive&###x2122; HD Technology which brings more power and color where you want it, for your corals and fishes, plus the freedom to use your smartphone or computer as a controller. This unique innovation in aquarium lighting allows you to direct power from the LED colours you have turned down to use with the colours you want to turn up, providing you with access to the maximum power output of your light, regardless of your choice of spectrum and creating the most vivid colours in your tank you have ever seen. By coupling HD technology with custom almost optically perfect, 80 degree, colour blending lenses we can direct all of the light into the aquarium, exactly where it is needed, providing optimum PAR with minimal light loss or annoying glare for the observer. &###xA0;Brilliantly simple and brighter than bright. Development between AI and D-D have achieved the perfect colour spectrum for the reef aquarium straight from the box, with strong emphasis on the crisp blue white hue that serious hobbyists in Europe demand. Building on AquaIllumination&###xAE;'s rich heritage of building world-class LEDs, the AI Hydra HD Series brings a new level of performance. At a maximum of 95 watts from the wall, it follows in the family&###x2019;s efficient footsteps. The Hydra TwentySix&###x2122; HD comes standard with 80 degree lenses giving you the best balance of power and spread. Our lens optics are custom designed, boasting greater than 90% optical efficiency and including a diffuse exit surface to provide improved color blending. The AI Hydra TwentySix&###x2122; HD utilizes the latest LED technology from leading manufacturers, arranged to provide the best performance. 6 - Cree XP-G2 Cool White (> 70 CRI) 6 - Cree XT-E Royal Blue 6 - Cree XP-E2 Blue 2 - OSRAM OSLON Deep Red 2 - Cree XP-E2 Green 2 - SemiLED 415nm 2 - SemiLED 400nm. The beauty of AI&###x2019;s new HD lighting platform is that it includes Wi-Fi control as standard. Use the myAI&###xAE; app on any iOS or Android device to easily set up or program one or multiple AI HD lights. Don&###x2019;t have a smartphone? Any Wi-Fi enabled MAC or PC will work. Use your iOS, Android or internet-connected device to control the Hydra HD, anywhere in the world! Want an even easier way to program your lights? We&###x2019;ve got you covered. Our Easy Setup wizard is a breeze. Our intuitive schedule mode is so easy to program you&###x2019;ll have plenty of time for more important tasks, like enjoying your corals. Set your lights to the exact color temperature your corals need with our handy Kelvin wheel. Then set the intensity with the inner wheel. SOFT CORAL/LPS/SPS: 24 x 24in. HIGH DENSITY&###xA0;SPS: 20 x 20in. The D-D Slimline Designer Bracket is a sleek and elegant solution to mounting your AI Hydra lights directly onto the back of your aquarium. Designed in in house and produced within the U. This substantial aluminium bracket allows you to mount your Ai lighting in style. Available in Black or Silver powder coated finish. Twin mounting points for secure fitting. 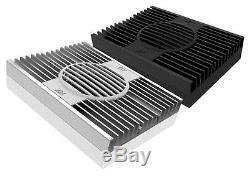 Suitable for Hydra (thin heatsink), Vega, Hydra 52/26 and Hydra 52/26HD. Remove the grill from your Ai light by gently pulling it up from the centre. Slide the light onto the bracket with the status light facing the mount (be careful not to damage the crystal indicator of the HD line of lights when installing). When in place refit the grill onto the light. Assemble the mounting clamps and tighten the black hex screws with the included hex key to attach the clamps to the bracket. Screw the long plastic black clamp bolt into the clamp and thread the included black plastic nut onto the thread of the bolt with the flaired edge facing the aquarium glass. Sit the mount on the aquarium and clamp the brackets in place , to adjust the light height loosen the black nex bolts on the back of the mounting clamps and raise or lower the mount to suit. The mount clamps are very secure so adjustment is best done with the light not on the clamp and the clamp away from the aquarium. Stick the included cable guides onto the mount, one to guide the cable as it leaves the light and the other on the back of the mount to guide the cable as it runs down the back of the mount. The mount is designed to clamp directly to glass or a rigid and secure upstand or pelmet, do not attempt to install the clamp on a pelmet that cannot take the weight of the bracket and light as the bracket may tip forward or at worst the light fall into the aquarium if the pelmet is not designed to carry such a load. Individual Light Hanging Wire Kit AI WIRE 05. A stainless wire kit designed to hang individual Aquaillumination LED lights directly from the ceiling. Can also be used to hang multiple lights that are connected with the AI EXT SYSTEM. Suitable for: HYDRA 52, HYDRA 26, HYDRA, VEGA, SOL. 2 x 1.5m hanging wires. 2 x Ceiling mounting attachments (screws not included). 2 x adjustable sliders for height adjustment. 2 x Y wires with balls on the end to integrate with the hanging rail. 2 x stainless steel plates to connect the wires to the light and to hold them in place. Screws and attaching fixtures will be required, specific to the particular ceiling construction. Hydra Single Light Arm Kit. The HMS Single Arm Mounting Kit is perfect for tanks that only need a single Hydra LED unit, or if you want to have multiple units without a rail running across your tank. The kit comes with mounting brackets for the Fifty-two and Twenty-six series of LED lights that can slide forward, backward, and also twist within the rails for the ideal position. The height of the mounting system can also be adjusted making it a great industrial looking mounting system for the Aqua Illumination Hydra LED lighting systems. The AI Hydra Flex Arm is specifically designed to securely hold the Hydra 26 and 52 series of LED lights from Aqua Illumination. The stiff, yet flexible arm gives you complete control over the height and positioning of your LED unit. The sleek look of the mounting arm is enhanced by the neoprene sleeve over the flexible portion of the mounting arm. The design of the arm mounting bracket lets the arm spin into the perfect position while holding the light securely, right where you want it. Unfortunately couriers pass on aditional shiping charges for these locations which we have to pass on. There are many reasons to shop online with Aquacadabra. Open six days a week and staffed by experienced aquarists with a love for the hobby, our staff don't just manage the welfare of our live stock on site, many also have tropical and marine aquariums at home. It is only by being enthusiasts for the hobby that a true understanding of fish husbandry can be obtained, whether it is understanding the requirements of your fish or knowing the appropriate piece of equipment that you require to succeed in the hobby. One final reason to shop with Aquacadabra is our inventory. When placing an order with us, you can rest assured we'll have the goods with you as quickly as we possibly can. We feel that offering a large inventory of products at competitive prices, tied to a high level of customer service and the reassurance that we are available for you 6 days a week for any fishy questions that you may have, Aquacadabra is the one stop shop for all of your aquatic reptile or pet needs. If an item over the specified value/weight is ordered to one of these locations, you will be subject to a &###xFFFD;6.90 surcharge from our courier. Our website features an extensive online Help section which covers all eventualities with orders; together with easy to complete forms to enable us to address any problems in as quick an efficient a time frame as possible. The item should be in an unopened and unused condition and you should notify us within 14 days that you wish to return the item to us. Please be aware that after bank holidays there is always a back log of orders for us to work through. Usually this is due to a courier being unable to locate an address, and unfortunately problems can from time to time be encountered when using any third party courier service. Please note that should a parcel be lost it takes 14 days before we can claim for the lost parcel. We will discuss the matter directly with you to ensure that you receive the minimum of inconvenience. Please do not send any faulty items to us directly as this may cause a significant delay in resolving the matter. We aim to resolve this type of problem in as timely a manner as possible. There are a number of circumstances when you may wish to cancel and/or return goods ordered. Once the Company has received and acknowledged your requirement, they will provide you with the necessary procedure which you must ensure is followed. Once an order has been placed it will be processed almost immediately. This means if you wish to cancel the order you will need to send the goods back to us once received. This listing is currently undergoing maintenance, we apologise for any inconvenience caused. The item "AI Hydra 26 LED Light Units App-Controlled Full Spectrum & Aquarium Mounting" is in sale since Tuesday, November 07, 2017. This item is in the category "Pet Supplies\Fish & Aquarium\Lighting & Hoods". The seller is "aquacadabra" and is located in bexleyheath,kent. This item can be shipped to United Kingdom, United States, Japan, Canada, Ireland, Australia, Germany, France, Greece, Italy, Spain, Russian federation, Austria, Belgium, Bulgaria, Croatia, Cyprus, Czech republic, Denmark, Estonia, Finland, Hungary, Latvia, Lithuania, Luxembourg, Malta, Netherlands, Poland, Portugal, Romania, Slovakia, Slovenia, Sweden, Brazil, New Zealand, China, Israel, Hong Kong, Norway, Indonesia, Malaysia, Mexico, Singapore, South Korea, Switzerland, Taiwan, Thailand, Chile.